Telecommuting. According to The Teleworker magazine, in 1997 4% of the total number of employees in Britain classed themselves as teleworkers. 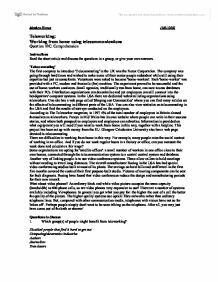 Matthew Hirons 10/01/2002 Teleworking: Working from home using telecommunications Question 10C: Comprehension Instructions Read the short article and discuss the questions in a group, or give your own answers. 'Telecommuting' The first company to introduce 'Telecommuting' in the UK was the Xerox Corporation. The company was going through hard times and wished to make some of their senior people redundant while still using their expertise but just as consultants. Volunteers were asked to become 'home-workers'. Each 'home-worker' was provided with a PC, modem and facsimile (fax) machine. The experiment proved to be successful and the use of home-workers continues. Small agencies, traditionally run from home, can now access databases with their PCs. Distribution organisations can decentralise and yet employees can still connect into the headquarters' computer systems. In the USA there are dedicated websites listing organisations using teleworkers. One site has a web page called 'Shaping our Communities' where you can find many articles on the effects of telecommuting in different parts of the USA. ...read more. What about video phones? An ordinary black and white video picture occupies the same capacity (bandwidth) as 600 phone calls, so are video phones very expensive to use? There are a number of systems available including Viewphones. In general you get what you pay for: the higher the cost of a call the better the quality of the picture. The higher quality systems use optical fibre networks rather than ordinary telephone lines. But, compared with other communication media, telephones with vision have not so far 'taken off'. Perhaps people simply don't want to be seen talking on the telephone. After all, you may just have come out of the bath or shower! Questions to discuss 1. Which group(s) of people might benefit from teleworking? Disabled people that find it hard to get out Computing/electronics industries Authors Journalists Translators 2. Why do you think teleworking in Powys is being supported by external European funds? Probably because the EU think that it is worthwhile for the future and has many advantages including reducing pollution from transport. ...read more. There would be large reductions in the number of commuters on the roads, which will dramatically cut the amount of pollution thus cause a reduction in the greenhouse affect. It will also reduce congestion on the roads. There would be a decrease in the use of public transport, which would have an impact on the local and national economy. Although if the workers are at home they may spend more money on their leisure time, which would have a positive effect on the local economy. 7. Why do you think that Boeing could cut the time needed to design and manufacture their new planes? Because of improved, world-wide communications. The video conference systems allow callers to hold meetings without needing to travel long distances. Pictures of moving components can be sent for fault diagnosis. 8. Suggest, with reasons, three types of organisations that could benefit from video conferencing. Manufacturing industries due to improved, world-wide communications and reduced costs for the company. International property investments because the people wouldn't have to travel to see the properties. Film/music industries because if people are far away and cannot meet up, some work could still be done. ...read more. The prices are an important factor, which is a huge drawback for this website. The main reasons are that the price for each DVD is very high, whereas these can be found in the local store for much cheaper. The main problem is caused by the delivery costs. Page 10 * The image and logo look professional and convey the ethos of the magazine effectively. * Enlarge the screenshot of the WLCT website a little as it may not be clear what the website is to some readers. This is called "learning". In the figure above, consider three computers X, Y, Z. Assume each sends frames to the other computers. The source addresses X, Y are observed to be on network A, while the address of computer Z will be observed to be on network B. As social advances amazingly, mobile phones and telecommunication are becoming more common. At the same time, the cost of using mobile phones and telecommunication are decreasing gradually. In addition, due to people can use telecommunication to get into conversation with the other especially for businessman, they can avoid time-consuming for travelling. determine and document what will happen within the project and how it will work. Within this section the planning, organising and the management of resources will be analysed to help allow the project goals to be completed effectively and efficiently. This is showcased in the following section. 2.2 Compatibility of Amazon.com with multiple platforms Concentrating on the browsers which make up the majority of the internet user base (using ), I will look at Internet Explorer 7, Firefox, Opera, Safari, and Google Chrome.